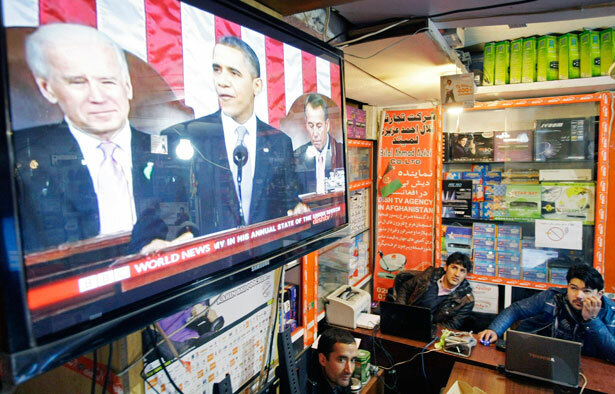 Drones, threats to Iran, praise for Israel, and a too-slow drawdown in Afghanistan. There’s lots to question about President Obama’s remarks in the State of the Union address, but for the most part he outlined a liberal to-do list that will satisfy, and energize, the Democratic party base. On foreign policy, not so much. It almost seemed as if Obama was saying: If I’m going to propose all this good domestic, liberal stuff, let me knock some heads overseas, OK? No, we don’t need to send tens of thousands overseas, we can zap anyone we want from the comfort of our offices. It may or may not be over by then, and even The New York Times has had enough, repeatedly editorializing that the current drawdown is far too slow and calling for all American forces to be withdrawn in 2013. In the meantime, more Afghan civilians will die needlessly, like the ones (including five children) who were blown to bits just hours after Obama’s speech. Obama has resisted calls from his own administration to join the civil war in Syria, and though he praised the rebellion last night at least he didn’t sound hawkish. Likewise, the leaders of Iran must recognize that now is the time for a diplomatic solution, because a coalition stands united in demanding that they meet their obligations, and we will do what is necessary to prevent them from getting a nuclear weapon. In other words, the status quo. By saying that the United States will “do what is necessary,” he presumably means that all-options-are-on-the-table thing. Really, though, no one – most of all Iran – is taking that seriously. Sadly, in talking about his visit to the Middle East next month, Obama gave a shout out to Israel, of course, and didn’t bother to mention the Palestinians: “And we will stand steadfast with Israel in pursuit of security and a lasting peace.” That, naturally, got a standing ovation from the Republicans. If that’s true, and if Obama intends to make the eradication of poverty a central goal of his second term, then that is true progress. It’s not that expensive – a few tens of billions of dollars and a cooperative international effort will kick-start the idea – and it is an achievable goal. But it means reordering priorities overseas, and getting the American people on board for a major, global effort.